It’s not just for the witch costume, kids. I’ve been intrigued by broomstick lace for a long time and yesterday I finally got around to trying it. I went online to search for videos and instructions but then realized that my copy of Crochet Stitch Bible actually has instructions for it. 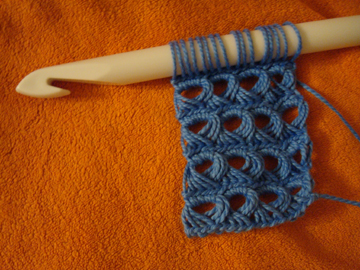 So… here’s my very first piece of broomstick lace. A 16mm crochet hook was acting as the broomstick and I used a DK weight yarn with a 3mm hook. It’s a bit wonky, but I finally understood how it works and it’s actually quite straightforward after a few rows. With a bit more practice on making it more straight I made this cuff with the same “broomstick” and a worsted weight yarn and 4mm hook. I just made it long enough to wrap around my wrist and then crocheted the short ends together. I really like the colour of that yarn. There are some broomstick lace videos on Stitch Diva Studios and they’re quite clear and easy to follow. 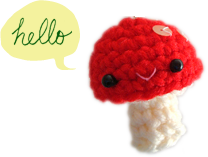 I’ve also found the written instruction on Crochet Cabana helpful. 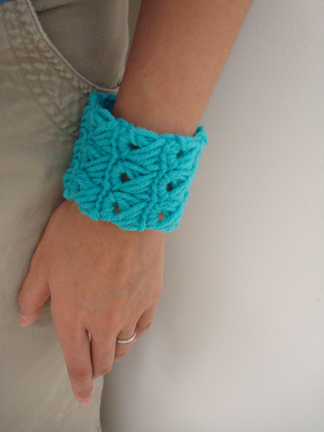 The idea of the cuff came from the tutorial on Kootoyoo. By the way, our internet is fixed! :D Though it’s kind of slow… I have a lot of pictures from the weekend that I want to post but am feeling weary that it’s going to either take a long time or crash the internet altogether… (not sure if that’s even possible. I’m not at all techy and sometimes I feel paranoid about techy things) so the pictures will have to wait until I’m sure that we have stable connection.